When tresses makes Crackle feel all trussed up. The fading light made the shadows look like long groping fingers as Crackle's mind-touch reached Newt and caused him to cast an eye towards the half open door flap of his den. **Crackle? What did you send? ** Newt rubbed his eye with a balled up fist. **Everything all right? ** He rolled onto his belly, flopping his face into his pillow. **Oh hey, sleepy head � didn't mean to disturb your rest, but it is almost nightfall. ** Her sending was laced with a friendly jibe. Newt sighed and buried his face deeper into the pillow. Crackle was well known for her insomnia and he could not help but wonder why it was his turn to suffer for it. Newt blinked as he felt apprehension in the brushing of her mind, but before his still groggy brain could focus, it was gone. He shook his head. **Sure. Give me a chance to wake up and I'll be right over. The cooling night air made Newt breathe deeply as he begun his ascent to Crackle's new den. She had made her den higher than the birds it would seem. He shook his head and smiled. His agemate had a flair for the extreme. 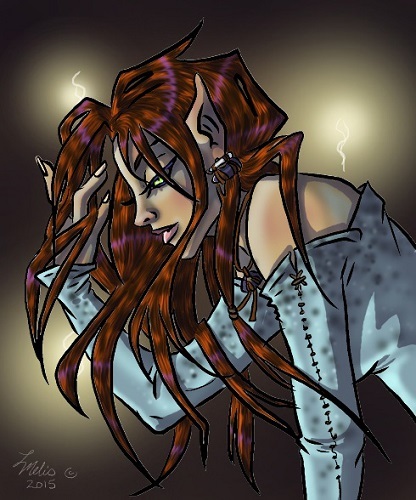 **These ones,** she answered, pushing back a mass of deep red hair. **How could you miss them? ** Her eye-brow raised, as a tendency of hers. Usually followed by a biting of her lower lip. Newt barely suppressed a giggle as Crackle bit her lip. The candle light shimmered off her hair with a glossy slickness. There were several red-heads in their tribe, but Crackle's hair had such a deep hue to it that it was not far from black at times. Like hot coals in a night fire. �I didn't say it about you. I said it about your hair.� Newt responded, holding steady under her amused gaze. �Oh yeah, that's way different.� Her smile softened, but her eyes still held his. �I guess you're off the hook. Maybe you could just braid it for me then? After all, being Greenweave's son should have benefited you some.� Crackle turned her back to him and pushed her lively hair over her shoulders. �Uh, right. All right then.� Newt frowned. Something different had just passed between them. Newt was aware he had grown up in some ways faster than Crackle, even though being two years her junior. Fadestar as well, seemed to have blossomed more quickly than the red-haired friend he and Fadestar shared. Newt smiled to himself as his hands worked through Crackle's hair, smoothing out the tangles. He felt pleased that he just witnessed a moment of Crackle's dawning. His smile lingered, also content that she chose to keep her wild mane, because he did think her hair was beautiful.